Cora Mae Freeman Gilbreath, 102, passed away on June 11, 2018 in her home. She was preceded in death by her parents, Mary Katherine and Marion Riley Freeman; her husband, Orville Gilbreath; and her three brothers, Isaac, Vance and Robert. Cora is survived by her daughter, Mary Faye Hudson; son, O.M. (Jr.) Gilbreath; six grandchildren, Stacey (Walter) Turner, Steve (Noelle) Gilbreath, Jeff Gilbreath, Curtis (Kim) Hudson, Kelly (Fred) Bester and Robert (Natalia) Gilbreath; three great-grandchildren, Nick (Ellen) Hudson, Rudi Lee and Alex Pachecano; and one great-great-grandson, Johnny Hudson. She is also survived by many nieces and nephews, who remember her fondly. 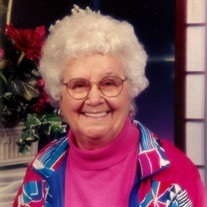 Cora was born in 1916 in Dade County, Ga. and was an active member of the community well into her 90s. She was a member of the Home Demonstration Club that brought women together in the 50s to share ideas and crafts. She was a wonderful seamstress and was known for her beautiful crafts. She was active with the Dade Senior Center, loved to travel and enjoyed cards and games. She loved gardening and always had beautiful vegetable and flower gardens. She will be remembered by many as a mentor and as a compassionate trustworthy friend. She has been the inspiration to many. Special thanks to Tapestry Hospice, especially Becky, Michelle, Stephanie, Ben and Diana, as well as all the staff. They all provided loving compassionate care. A special thank you to Jane Freeman Ellison for her loving care, the Freeman kids and Juanita Blevins. Graveside services will be held 11 a.m. Thursday, June 14 at Corinth Cemetery in Fyffe, Al. Family will receive friends from 2-8 p.m. Wednesday at Ryan Funeral Home, Trenton.